My company can provide you with quality signage at economical prices. I sincerly hope that the following information and introduction of my company might be helpful when planning your signage needs. There is one way to distinguish one sign company from another. You look for a reputable and experienced company with innovative technology to help expedite your decision. Your choice of a sign company should be able to handle challenging projects while working within a limited time frame and have a versatile line of sign making equipment that can provide your needs and demands with a high level of productivity. Tri City Sign Company Inc. has been in business for 22 years with 30 years of sales and manufacturing experience within the ownership; and 35 years experience in our fabrication, installation, service, and graphic art department. My company can provide you with the highest quality of the following services but not exclusive to channel letters, custom cabinets, reverse channel letters, routed faces, directionals, monument signs, flexible sign faces, awnings, large format digital printing, and window graphics; electronic message display and LED gas changers. Our graphic art department can create a design for your approval or work one on one with your marketing department to create the perfect design that offers quality, visibility and competitive pricing. It is my promise and policy that my company will provide my customers with unparalleled quality and value for all their signage needs. Thank you so much for taking the time to learn about my company. Please feel free to call 800-339-4779 and speak to us. 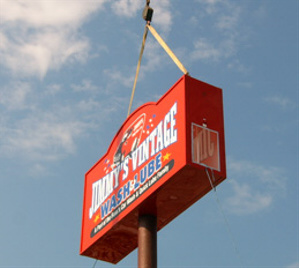 Jimmy's Vintage Wash and Lube is a recent Design, Fabricate, and Install project. The sign is 7'-0" x 12'-0" with a overall height of 30'-0". The faces of the sign were cut from cooley material with vinyl graphics applied for the graphics. The sign also has two single face LED message units.